on the chemical treated PTFE surface that can laminate steel and rubber sheet. 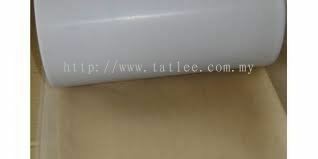 These PTFE laminated sheets can be used as bridge slide block,anti-corrosive sealing and diaphragm value etc. It conforms to the enterprise standard Q/GHAD7-2000.